The New Vaporesso Renova ZERO Ultrua portable Pod System has reset the bar for refillable POD systems. It comes with a new innovative Child-Proof Filling System, the Press to Fill (PTF) mechanism, which allows for easy filling and significantly reduces leakage. Renova’s cutting-edge Omni Board mini provides multiple safety protections. The built-in 650mAh battery includes with Quick Charging technology to halve your charging time. It takes only 45minutes to fully charge the 650mAh battery on the ZERO. The ZERO All-in-One Kit utilizes a CCELL Coil with ceramic heating elements for a flavorful and consistent vape with longer-lasting capability. You can now use the ON/OFF button to to power or set off your ZERO device and avoid any mishaps and choose your desired vaping mode with a few clicks. 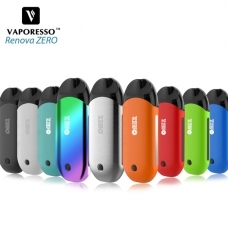 Optimized for entry level users and individuals looking for a high nicotine vape system, the Vaporesso ZERO System is a phenomeal option for the portable vape pods systems.